An Emirati expert and entrepreneur has developed a new and revolutionary hair treatment – the first of its kind in the UAE – to rejuvenate hair and remedy chronic hair problems. With support from the Khalifa Fund for Enterprise Development, Dr Mariam Al Mulla developed the treatment that was the product of two years of extensive research in collaboration with one of Korea’s leading cosmetic pharmaceutical companies. With the new product line, Dr Al Mulla is working to establish her brand, HairLovie, as a leading hair care centre in the UAE, with groundbreaking treatments and innovative cosmetic procedures, all developed by Dr Al Mulla herself, before moving on to the next phase and promoting the centre across the entire Gulf region. Dr Al Mulla noted that the treatment she had developed was the result of in-depth research exploring chronic hair problems most people suffer from, which usually require long-term, and often costly, remedies to resolve – particularly in hot climates, such as the GCC. With several years of medical experience, the Emirati expert developed a vitamin-rich cosmetic treatment, free of harmful substances, to promote hair growth and health. Dr Al Mulla underlined the ample support her project had received from the Khalifa Fund for Enterprise Development, among other Government entities in the UAE, which paved the way for HairLovie to hit the market. The treatment includes the HairLovie Rejuvenating Mask and the HairLovie Shampoo, both protein and vitamin-rich products that help reverse hair damage from frequent cosmetic procedures. The Mask contains seven amino acids for strengthening and restoring hair vitality; 12 types of plant antioxidants to rejuvenate and nourish the hair; henna derivatives, olive oil, and coconut oil to nourish the hair; and silk proteins and natural keratin to provide softness and vitality to the hair texture. The Mask is safe to use for all types of hair, all while being particularly suited for dry and damaged hair. 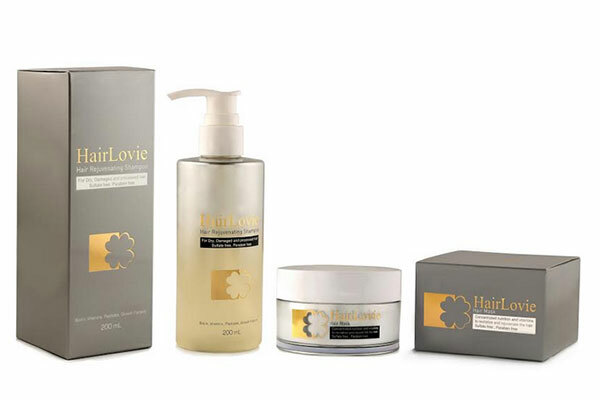 As for the HairLovie Shampoo, the ingredients include four types of Peptides to stimulate hair follicles, as well as Arginine, Biotin, Panthenol (Vitamin B), Ginkgo Biloba leaf extract, white mulberry extract, Salicylic acid, Citric acid, Hydrolyzed silk protein, Keratin Protein, Lavandula Angustifolia (Lavender) Extract, and plant-sourced antioxidants. The Shampoo is Sulfate and Paraben-free, with a balanced pH of 5.5. Regular usage of the Shampoo helps keep the scalp clean, healthy and pH-balanced; maintains follicle strength by nourishing them with peptides; rejuvenates the hair shaft to fight signs of premature aging; and repairs the damage from frequent cosmetic or chemical treatments.